FLINT, MI — So far, eight people looking to nab the mayor’s seat in Flint’s recall election say they will faceoff during a Tuesday, Oct. 24, 2017, mayoral from at the Flint Public Library from 5 to 7:30 p.m. Confirmed for Oct. 24 are Ronald Higgerson, Scott Kincaid, Sean MacIntyre, Anthony Palladeno Jr., Don Pfeiffer, Jeffrey Shelley, Angela Ward and Arthur Woodson. 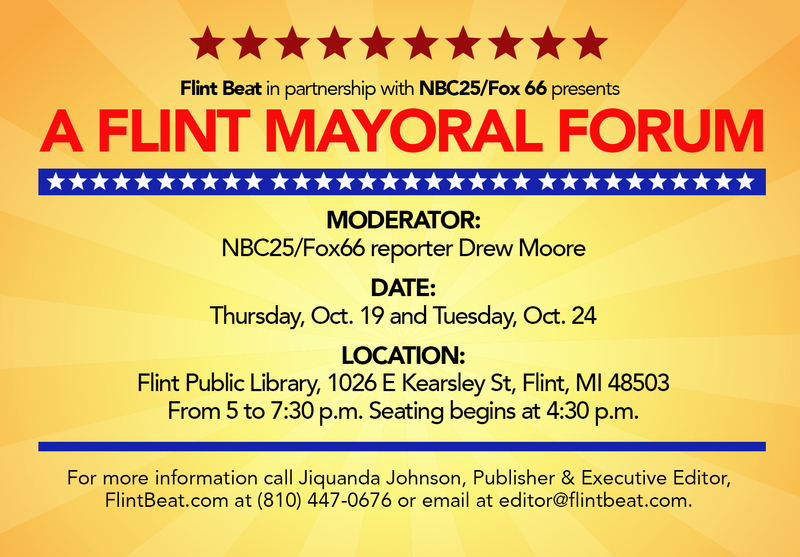 The event, “Flint Mayoral a Forum” is partnership with Flint Beat and NBC25/Fox 66. Five candidates, Chris Del Morone, Anderson Fernanders, Ray Hall, Brent Alan Jaworski and Al Wamsley, participated in the first of two forums on Oct. 19. Candidates Woody Etherly, Ellery Johnson and David Meier did not participate but had confirmed the night before that they would be participating in the Oct. 19 forum. David Davenport told Flint Beat he would not be able to commit to participating the forums and Flint Mayor Karen Weaver has not responded to invitations to participate on Oct. 19 or Oct. 24. Seating begins at 4:30 p.m. with the event beginning promptly at 5 p.m. NBC25/Fox 66 reporter Drew Moore will be moderating the forum. For more information call Jiquanda Johnson at (810) 447-0676 or email her at editor@Flintbeat.com.